When Nancy Grimm joined Wissing Miller in 2016 as a paralegal, she had almost two decades’ experience in IP prosecution and management. She currently collaborates with the firm’s partners, clients and foreign associates in the filing and prosecution of patent and trademark applications, and handles related formalities, amendments and other actions. 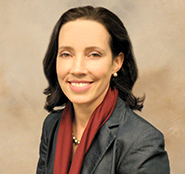 She is experienced in the Patent Cooperation Treaty (PCT) and other international conventions. In addition, she supervises the firm’s docket; develops internal processes for client communication and file portfolio management; and provides general administrative support to the attorneys. Prior to joining Wissing Miller, Nancy worked as a paralegal at Dilworth IP LLC and Perkowski & Associates, P.C., handling domestic and foreign prosecution of patents and trademarks. Nancy graduated from Thomas Aquinas College, Santa Paula, CA, where she received a B.A. in Liberal Arts, majoring in the Great Books Program. In her spare time, Nancy is still an avid reader, and she loves to sketch.